When Andrew Thornton announced a challenge based around Halloween, what is any self respecting witch to do but join in. I had images of all the fun that the ghosts, ghouls and vampires have on Halloween. 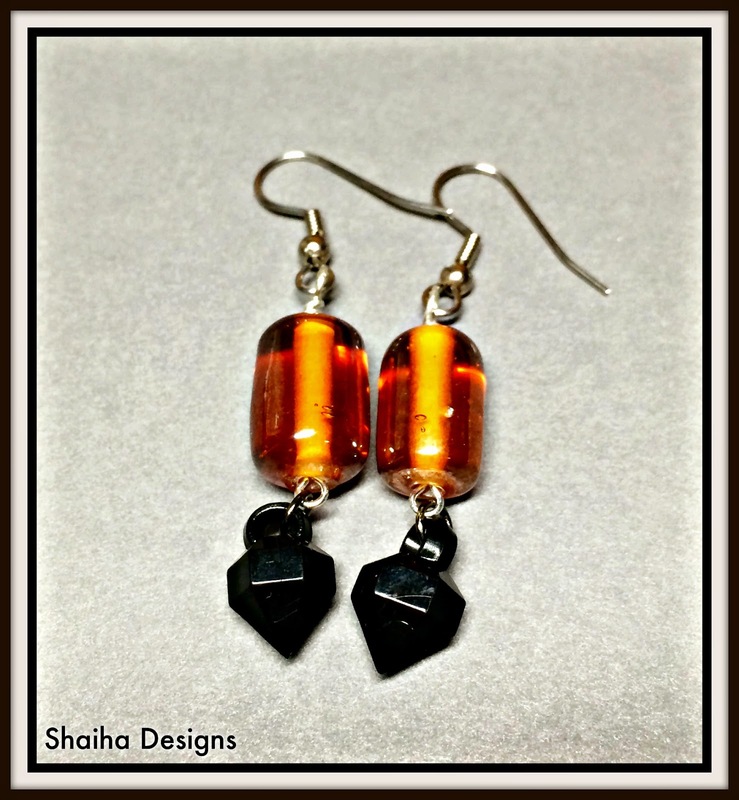 And jewelry celebrating black and orange which is a color combo that I quite like. And just look at the wonderful goodies that Andrew sent along. I am in love with those two orange and one black bead caps up in the upper left hand corner. Yeah you head me right. They are glass bead caps. Oh and those aren't all the goodies that I got. There was also a couple focals, one of them made by Andrew, some seed beads and waxed linen. I went with earrings mainly this time around because I still need to get some pairs made to send to Ears To You. I set a goal to send along 30 pairs this year and I can't find the first couple batches I made so I really need to get busy on that. 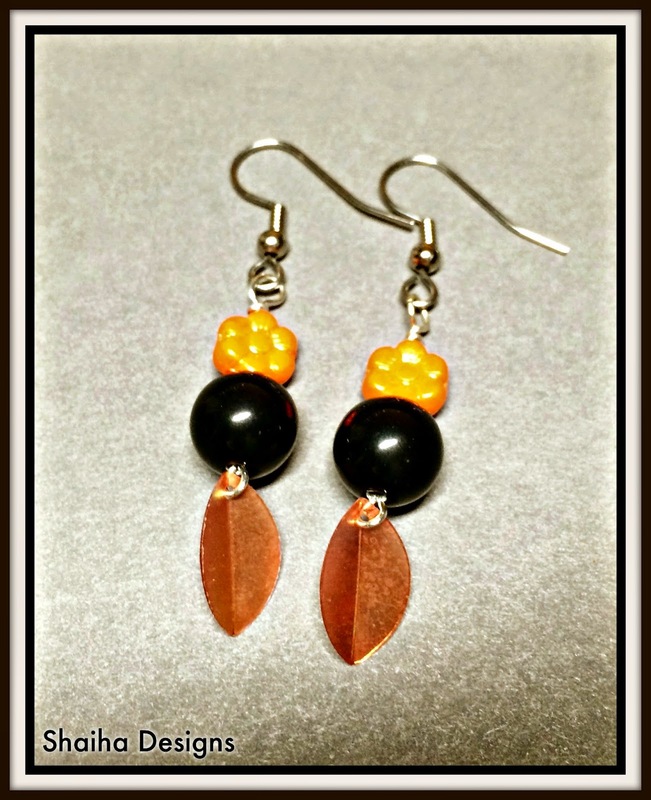 This pair is the only one that I made that fits the eerie ambiance of the holiday. I used some of the black crystal in the kit and wire wrapped them up with art tiles from Asbury Ave. They are currently up for sale here. These next two pairs were made from the ingredients that Andrew sent along with the exception of the ear wires. They definitely celebrate the season and the spirit of fun that it is known for. These two will go to Ears To You. When I received my goodies for this challenge what immediately caught my eye was this carved focal piece. I am not exactly sure what it is made of but it is interesting and begged to be wire up with a copper tube that was also part of kit. I had also just gotten a shipment of tassels which seemed to be serendipity. Since I really wanted the focal to catch the eye, I hung it off of a piece of black rayon cord that was also part of my goodies. Now since this is a challenge that celebrates the season and tomorrow holiday, Andrew limited it to thirteen of us. 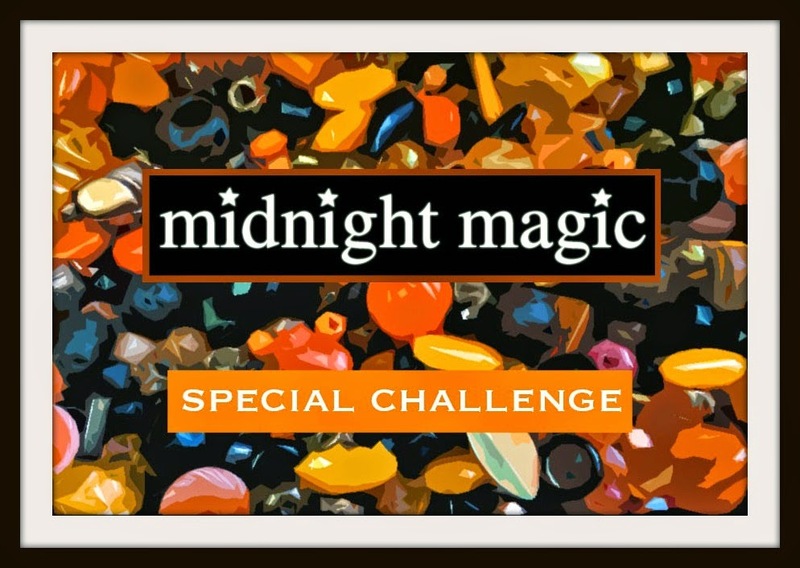 Be sure to check out what everyone else has made with their beady magic. 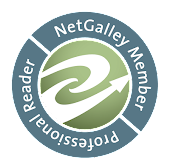 Just click here for the links and to see what Andrew has been kind enough to post for the folks that don't maintain a blog. 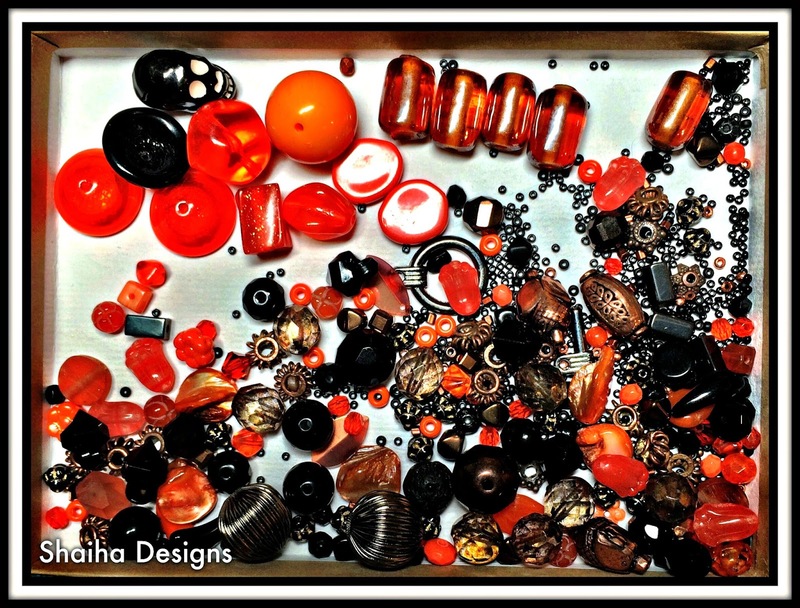 Beautiful designs, Shai :) I love orange! Great job Shai. My favorite is the second pair of earrings. Lovely pieces! This challenge has brought out the earrings in full force. A few of the other participants focused on making earrings too! The earrings you made are darling! And I think that's such a creative use for the Hamilton Gold tube component. Thanks so much for participating again! Thank you so much! I think that I am becoming addicted to the Hamilton Gold components that you send out. Never came across them before your challenges. Happy Halloween! Great job, love everything about the tassel pendant ! Love the copper tube/tassel focal! Curious, what is Ears to You? Sounds cool. Love all the earrings! and the combination of the carved piece and the tube...I was thinking along the same pairing but couldn't really get it to come together in a way I liked...love what you did though! Happy Halloween! Your earring designs are great. I love the tile scripts...totally cool!! 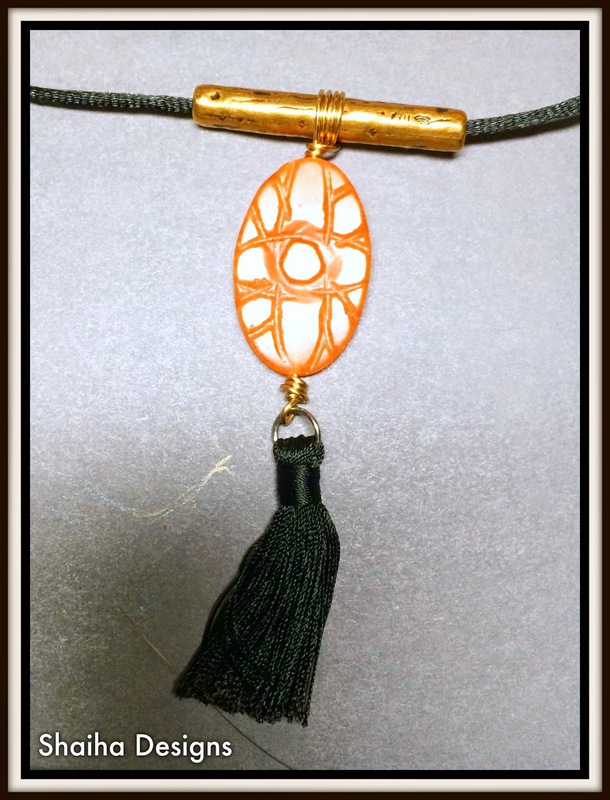 Great job highlighting the beautiful focal with simple wire-wrapping and the black tassel. Very elegant!! I love what you've made! 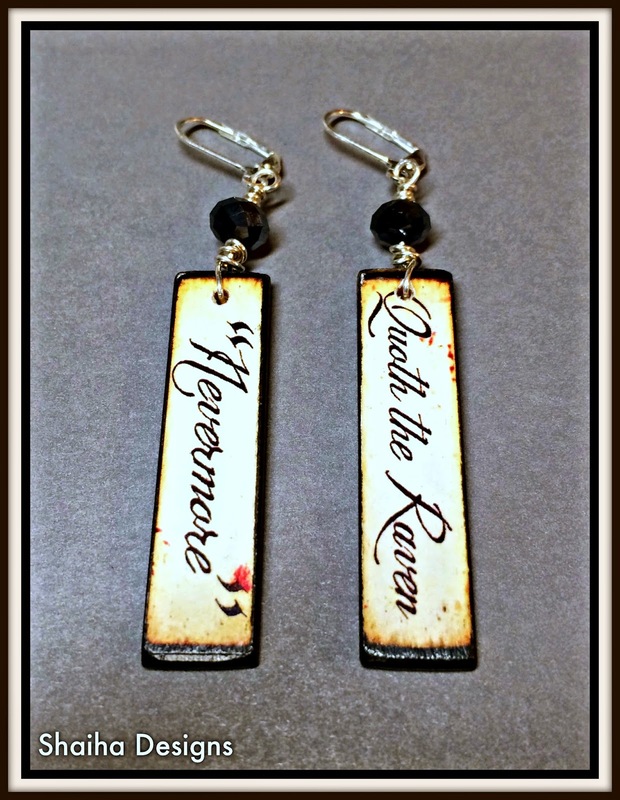 My favorites are first and last - the Nevermore earrings and the necklace with the tassel. Fabulous!